The McGee Law Office is a distinguished boutique law firm in Smithland, Kentucky, that has served clients throughout Livingston County for more than 85 years. 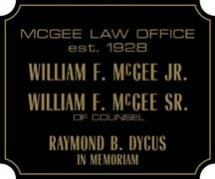 William F. McGee Jr. is a veteran civil and criminal litigator with a track record of successful resolutions. As a longtime practitioner, Mr. McGee has successfully handled felony criminal charges, drug cases, personal injuries and family law issues. At the McGee Law Office, you can expect candid legal advice and guidance that will help you make the best possible decision. Mr. McGee is committed to getting great outcomes for clients by keeping them informed at every stage of the process. Mr. William F. McGee Jr. learned about the practice of law from his father and grandfather; he is a third generation attorney who is admitted to practice in all Kentucky state courts and the United States District Court for the Western District of Kentucky. Mr. McGee has decades of experience and his reputation accurately reflects his elite legal skills. McGee Law Office has been rated AV Preeminent* by Martindale-Hubbell - this is the highest rating possible from Martindale-Hubbell. This rating means that the McGee Law Office has a nationally recognized record of peer-reviewed distinction and excellence. Through our firm's advocacy, we have established new case law and are always looking for new and innovative ways to defend and assert our clients' rights.